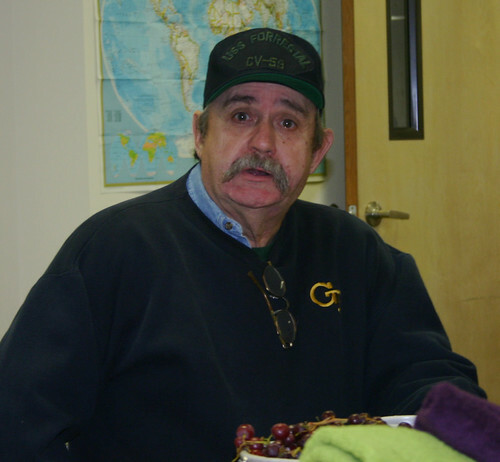 Steve is one of the recently evicted Homeless. Below is a video of him talking about Mark, the mentally ill homeless man behind the mound of dirt (see the earlier account about Mark here). The conversation took place in a dinner meeting at Macland Presbyterian Church along with two other homeless evictees and members of the church. The video was made Wednesday, January 30, 2008. Mark…. you know… Mark. Mark’s a good guy. Mark’s an educated guy. Mark is a guy that is losing his mind. His wife brought him over on 41 (nearby highway), dropped him off about four, four and a half years ago. And he’s still sitting there, waiting on her and his kids to come back and pick him up. Mark goes months and months and months without a shower. Mark’s a good guy… you know? Well they made him move off that, his mound where he’d stayed four and a half months, you know right there by the fence by MUST. Well, he had no where to go, so he moved down the walkway (by EMC?). Today, he had a bed and bunch of blankets, pillows and everything, and he was just laying there just waiting on his wife to come back and get him. Today the Marietta City and I don’t know who else it was, came and left him there and took all his blankets and left him there with no no warmth at all. So, if something doesn’t happen to him tonight, it might be the night of the next Dominic, you know. He don’t have nothing except a coat and toboggan for cover. A few minutes later Steve was saying he was going by there later that night and take him something (inaudible) to help him. As I mentioned in the earlier post, other homeless people had been bringing Mark blankets, clothes and sack lunches and leaving them for him. The compassion of the homeless is infinitely greater than that of the city that proudly touts “The All-American City” Award in 2006 from the National Civic League, and a “City of Excellence” in 2002 among others in vaious years. Way to go! Take the blankets right off a mentally ill man and just leave him there to possibly freeze to death! The trespass notice from the Marietta Police. 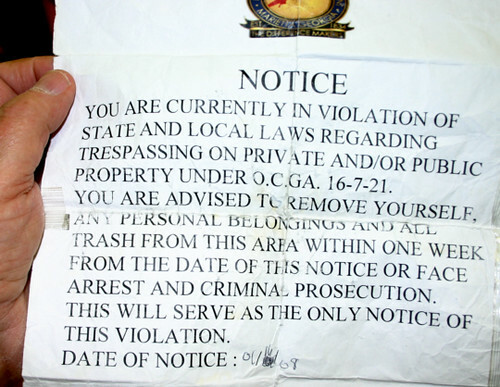 A person commits criminal trespass when he does one of five things: 1) intentionally causes damage to the property of another without his consent and the damage is less than $500.00; 2) knowingly and maliciously interferes with possession or use of the property of another; 3) enters upon the property of another person for any unlawful purpose; 4) enters upon the property of another person after receiving notice from the owner that such entry is forbidden; or 5) remains upon the property of another person after receiving notice from the owner to depart. Punishment: Misdemeanor, with up to 12 months to serve. I’m certain that the property owner has the right to forbid entry to anyone and to demand that they leave at any time if already there. That is as it should be. Owners putting up trespass signs is also normal practice. Trash removal is not part of the trespass law. Who can say who put the trash there over a period of years? But I don’t understand. The owner was never present and the first 3 don’t seem to apply. I would like to see one of these owner/police agreements to see whether the police were made agents of the owner and also know if any of the owners ever saw the notice or understood how the agreement would be used. I know that refusal to obey a direct order to a policeman will get you in a heap of trouble, but this? I think I remember once signing such an agreement many years ago because there were hoods selling CDs in my parking lot that would leave only after I asked them to, then would come back. The police would not do anything in my absence without the agreement. I would never in this world approve it being used to evict the homeless. I had planned, indeed promised the Mayor, to post the city of Marietta’s response to the problems related to the homeless camps which I finally received yesterday. I had also promised to critique it. However, I found so many holes in that response that in all decency, I’m asking the Mayor to withdraw it. I’ll send him a private copy detailing the many errors and let him decide if he wants me to publish it. I take no joy in such a critique. It is after 3 AM here so he will have to give me a few hours rest before I send it. The problems with the response are leagon and obvious to the casual observer. I find this story very interesting. A woman with a beach-front duplex near the Ulehawa Beach park in Hawaii was fed up with the homeless encampment across the road from her. Marianne Beaman had lived there for 9 years. Today, she resides in that encampment, in a tent less than 50 yards from the duplex she and her husband, Bert, rented for nine years. Now the city is closing the park for a week beginning February 10, 2008, so that it can evict the homeless permanently from the park. Now Marianne is concerned about losing yet another place to live. Yet another systematic homeless eviction process by another city with no place to send the displaced. The Beamans had never been homeless before their landlord decided to convert their duplex unit into a vacation rental a while back. Six months ago, the couple and their two dogs began an anxious and reluctant occupation of Nani Kai Beach. “At first we said, ‘We’re not going to move to the beach, we’re going to find a place to live,’ ” Marianne Beaman said. “My husband works. I’m on Social Security. But, we could not find a place we could afford. We don’t have any relatives here we can live with. So, finally we used our savings to build a shelter that would protect us from the weather. Hopefully this will never happen to any of our Marietta city leaders nor to any of our readers. But it does happen to tens of thousands of people nearly every month that never had a clue that it could happen to them. It has happened to perhaps thousands of people in our small city, considering that the homed/homeless situation has considerable turnover in their makeup. For every homeless person, there are likely 8 to 10 that have gone before them. The program director of MUST Ministries has said he thinks there are as many as 1000 homeless men and women unsheltered in Cobb County Georgia at this very moment. The last homeless count I’m aware of found only 330 unsheltered in January 2006. The truth may lie somewhere between as it a simple fact that there is no way a small group of housed volunteers can find a homeless man in the woods if he is not interested in being found. And none of them are. We know of about 150 that are fed breakfast on Sunday mornings in one small area of Marietta. This is an area that is sparsely populated by the homeless because the camping areas are almost non existent compared to south of the city and in the county. MUST and their free lunch program is a draw to be sure, but the fact is, only a very few of the city’s homeless live near there for lack of cover. It is an industrial and business area with crisscrossing roads and very few areas with trees and shrubs to hide campsites. Someone once said that we all, each and every one of us are at most only two tragedies from homelessness. It could be a family illness coupled with a job loss or any number of similar situations, including fire, earthquake, storm, abandonment, death of loved one, mental illness, service in war, or simply a landlord deciding to use his property in a different manner as the Beamans found out. Also we all know that foreclosure is forcing hundreds of thousands out of their homes. Couple that with another unfortunate event and many of these will be homeless. Unexpectedly and unwillingly homeless through no fault of their own. Combinations of these unexpected events can push almost anyone into homelessness at any time. Not drugs, not alcohol, not laziness, not gambling, not any of those things. Think about it. Many of the homeless in the woods near your neighborhood are just plain people like yourself that have hit a couple of speed bumps in their life too many. Repeat after me: “There but for the Grace of God, go I”. Say it 3 times. But then, what does Marietta Care? If you have read any of the 6 or 7 previous posts, the answer is that the City That Doesn’t Care cares nothing about the homeless! They have sent the Storm Troupers to roust them out and dump their life support systems into the garbage trucks. In the dead of winter. On the eave of the two coldest nights of the year. Even with snow on the ground. Without their blankets, without their tents, without their backpacks, even some without their shoes. Yes, even the mentally ill who have no idea what is happening have been run over. Jack-Legged Storm Troupers? Maybe not quite that bad, but the homeless say it was not too far from it. Heartless, certain. Some of our police did not like the action taken, but each and every one knows they must do their duty. When the Mayor says go, when the Council says clean them out… no choice. None indeed. Even our veterans, our homeless heroes. Out. Out. Out! You left some trash. You made somebody’s employee nervous when she saw you standing under a bridge the other day. Out! This is the same shamefull city counsil that refused the VFW the right to give out flags alongside their float on Veteran’s day while the Mayor rode up front in grand style! Now our homeless veteran friends clearly understand how Marietta supports our troups. Particularly those in need. Al, Perry OUT! Take your flags with you! So says Marietta, The City That Doesn’t Care! This is a long post, and in it I will tell some interesting stories about the homeless we’ve met and love as friends. But I need to say something up front about our city leaders. In my last post I listed the names and email addresses of City officials. The intent was not to harass these individuals, but to express only our outrage at the actions of a City That Doesn’t Care, or to express support if that is your desire, over the death of Dominic. All of these City Council men and women, the City Manager, and the Mayor are good and honorable people and should be treated with dignity for the office they hold and as caring people. Keep in mind that Mayor Dunaway has no voting power except in a tie, even though he wields enormous power in other ways within the city, as any mayor does. Our fight is with the collective body that makes up the whole, the Council and leadership of a city that would not listen to the cries that warned them that great harm and deaths would occur if they sent these people away from their homes in the dead of winter. Some of our homeless did die, frozen to death. The city leaders read our request beforehand and the Mayor phoned me that they would go forward with their evictions even though snow and freezing temperatures was forcast. Representatives of the city attended a meeting at a local shelter and said the same thing. And Dominic is dead, and it appears there are others. So express outrage yes, but call them names, no, threats, no. Express your own feelings either way on the subject, but stay calm. It is the city itself to blame, not the individuals who might have raised a voice but was voted down or failed to raise a voice when it would have meant something, perhaps not realizing the impact on the lives of hundreds of people, perhaps thinking the warning of possible harm or death was an overstatement when it was not. Having said that, let me give you a few little stories on some of these men and women that we have learned how to be friends with. Now here is a disclaimer: I am a member of this church we call Macland Presbyterian, an elder, now on the session and a 3 year member of the Mission team. But I don’t have any first hand, hands-on experience with the particular homeless we are talking about other than meeting them as they came to our church and sitting down to talk with them. Whenever I say “we” I mean our team that has been working with them. Several families doing missional outreach have been doing all the cooking, serving, bible study and outreach for our church. They have paid for food out of their own pockets, taken winter clothing and other things for the homeless, brought them back to church and taken them to restaurants, had coffee and broken bread with them, brought them to Church in their own cars, stored their belongings when displaced, done bible study with them. I’ve only supplied a little support here and there. They have been doing the work. I’m relating what they have told me about our friends. Having said that too, let me tell you something about what I know from Pat and Scott and Jeff, and Jason about their encounters with the friends they have been serving. I just want you to know that this is not first hand knowledge, but it has struck my heart and I will be much more closely involved from now on. I know some of these names are not the real names. But the stories are real, the men are real, the hardships and problems they illustrate are real. One of these men, a homeless veteran is Perry. Perry has been described by Pat as “having an entourage of people swirling around him in his head always talking to him.” Perry came to our church among the first two to accept our invitation to visit. Pat and Scott picked him up. During one sermon our Pastor was talking about the woman who gave all she had, a penny, and what a wonderful thing that was. Perry got up in the middle of the sermon and started for the pulpit. Scott caught up with him and asked what his intentions were. “I’m going to make an offering”. “But wait, there is a time for that later”, said Scott. “But I want to give now!” So Perry took his Chucky Cheese gold token to the alter and placed it on the corner of the choir railing, and returned to his seat just beaming! Grinning from ear to ear. Gave all he had, real gold to him. I don’t know what happened to Perry when the evictions came. I think that he had dissappeared. We know of one death, Dominic, and we know that there is likely more – I learned today that the medical examiner sent a homeless person to a funeral home near our church who was apparently found in the same lot we were serving, but Dominic had been found somewhere else. There is another victim that we have recently identified as Mark. Mark was first found by our little missional team some weeks ago. Mark was laying behind a large mound of dirt, flat on the ground with piles of donated clothing, blankets, tarps and other stuff on each side of him. Much of it donated by other homeless in the camps. Other homeless were bringing Mark sack lunches and most of the time the lunches were just left there uneaten the next day. He would take neigther food nor drink from us. He was never seen to move from that spot by any of our team over a period of weeks, and he never changed clothes. We have since learned that Mark survived the cold, but this past week, our homeless friend Steve told us that the police and others came back Wednesday of last week and took his bedding, blankes and other things. See my video where Steve talks about Mark, how he became homeless and why he was staying right where he was. He was not aware he was being subjected to eviction. He would not have been responsive to the police or anyone that approached him. He was unable. (Updated on February 2, 2008 to insert new information). There is another I’ll call “Aloof” who showed up when they first started feeding breakfast. We noticed a man standing like a statue with his back to the breakfast line about a block away. Although invited, he did not move while we were there. The following week, he had turned around and was facing the other men and women enjoying a breakfast feast, but still did not approach, still a block away. (Since MUST feeds a lunch to the unsheltered homeless 5 days a week, our team chose to go on Sunday mornings to fill in). The third week he moved half way to the chow line. The fourth, half way again, always standing like a post during the entire time our team was on site. The fifth he had moved up to where he was just outside the line but could see the food clearly. Finally he began joining the line. We had gained his trust. Then the city came the next week and destroyed the little life support that he had. His hidden camp taken away and all trust dragged to the dump in a garbage truck with his belongings. Then there are Steve and Don who lived under a nearby bridge. And a different Al than ours that had a girlfriend. And “our” Al who is indeed a veteran who has been working almost from the beginning to get his life back in order to get off the streets. What I’m trying to say is that although our Al and Steve and Dave/Don have been mentioned in earlier posts a number of times, this story is not just about them, nor is it just about veterans, nor is it any way about us! It is about a city leadership that never took the time to learn that these are real, actual human beings in their care who have issues to be sure, but most are honest, decent citizens that have fallen on the hard times that, but for the grace of God, go I. It is about a city that paints all homeless men in one brush. If one did a crime, then paint them all guilty. They are faceless, nameless, scum to be run out of the city. They are trash to be swept away. It is about a City That Doesn’t Care that decided that, with the homeless count coming up that they just did not want the world to know that they did not have a place to put them. The goal was to run them out of town to reduce the numbers, achieve a goal of homeless reduction. The goal was to let the secretary that saw what looked like a homeless man down the block know that the city was protecting her. To let the business man that had a female worker nervous because she saw a homeless man standing under a bridge on the way to her office know that she would not have to look the other way any more – he would be gone. To let the voters know the city was removing all the homeless because 1 or 2 were thought to be part of a crime wave in another part of the city. To let the voters know that all laws will be strictly enforced – unless it was convenient to look the other way. But for homeless, strictly enforced. It is about a city that chose to evict the homeless from the only home they have had for years on the eave of the two coldest nights of the year – driven out in fear, leaving even their glasses, shoes, sleeping bags and tents behind to be thrown into garbage trucks by a City That Doesn’t Care. A city that supplies no support services other than law enforcement. A city that relies on the county morgue to front the $400 to pay for the burial of victims of their lack of concern for the welfare of another human being. It is about human dignity when down and out. About trust when trust is vital but not allowed. About compassion, love and hope in a world that seems to have none. What did Paul say about the Apostles? 1 Corinthians 4:11 To this very hour we go hungry and thirsty, we are in rags, we are brutally treated, we are homeless. I wonder how many angels were present among the homeless to test us? Who is marked as a sheep and whom a goat? Who among us will our Lord not know? Mayor Dunaway is the one in the red tie. He is one of the good ol’ boys of the community. Ward 1 includes the site featured in the AJC article today “Marietta police clear out homeless” written by Yolanda Rodriguez There you can find a gallery of pictures. Ward 5 includes the site featured in most of my articles. It includes the area our homeless veteran friend Al and the recently deceased Dominic lived.